Universities have had an association with Freemasons for hundreds of years. In 2005 UGLE launched the Scheme to help to forge links between well placed, enthusiastic Lodges and the many students and other young people who are seeking to become involved in Freemasonry but who may not know where to begin. So around the country are many Lodges who actively seek recruits from local Universities and similar educational establishments, be they undergraduates, post graduates or university lecturers. In East Lancashire we have Old Mancunians Lodge which meets at the Masonic Hall on Bridge Street. 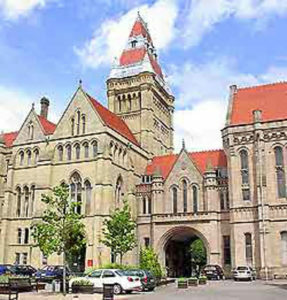 It has attracted many young men, mainly from Manchester University but occasionally from MMU and Salford University. The Lodge also takes graduates from all over this country, and abroad, who have come to live/work in the Manchester area. At Bolton, in the Western Area, we have Goulburn Menturia 3478 lodge which is also a member of the University Scheme. Across the Province we have a number of cities associated with Universities and we hope to engage more with these over the coming years with the development of further scheme Lodges. Young men are under-represented in Freemasonry and we want to expose as many as possible to its benefits. Of course students join, graduate and often move on, but the beauty of the scheme is that most Provinces also have receiver Lodges to look after graduates moving to that area. The truth of the matter is that many Lodges in East Lancashire have graduates or undergraduates as members, depending on the members knowledge of Freemasonry and prior affiliation. So just because you are at University doesn’t mean you have to join a scheme Lodge, but they are set up to look after your particular needs and cater for such members very well. If you want to read more about the University Scheme take a look at their website HERE. There are many men out there who are looking for some greater meaning to life. Freemasonry in open to all men, regardless of religious, political or social status, and while this scheme is focussed on a particular niche, as a Province we are keen to engage with men from all walks of life including ethnic and other minority groups. We have many Jewish, Moslem, Sikh, Buddhist and other members. Many did not understand that Freemasonry has been welcoming to their particular religion or way of life for hundreds of years, and have entered our Order and found it, as a philsophy for living, completely compatible with their beliefs and culture. if you want to find out more then make contact with us and we will do the rest. We often have open days, come and try events and functions open to the public which we will promote on this website to give you the opportunity to see what we have to offer.